There is always something going on in science and emerging technology. However some weeks just bring a bumper bundle of interesting things all at once. Here in the UK the biggest event had to been the near total eclipse of the Sun. We had some great coverage on the the TV with Stargazing live sending a plane up over the Faroe islands to capture the total eclipse. 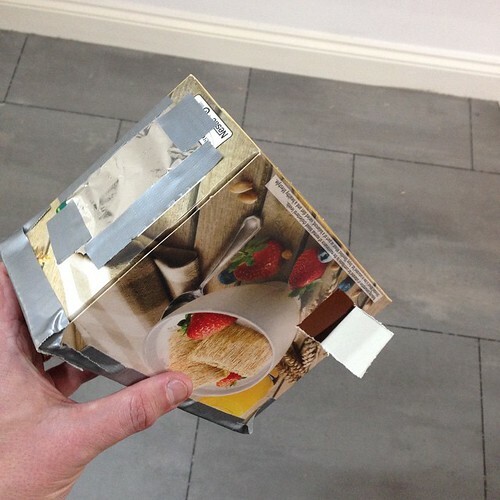 I was all armed and ready with a homemade pinhole camera. This brings me on to our technological change and the trajectory we are on. In 1999 I was in IBM Hursley with my fellow Interactive Media Centre crew. A mix of designers, producers and techies and no suits. It was still the early days of the web and we were building all sorts of things for all sorts of clients. In particular during that eclipse it was some more work for Vauxhall cars. We downed tools briefly to look out across Hursley park to see the dusk settle in and flocks of birds head to roost thinking it was night. It does not seem that long ago but… it is 16 years. When we were building those quite advanced websites Amazon was just starting, Flickr was 6 years away, Twitter about 7 years away, Facebook a mere 5 (but with a long lead time) and we were only on Grand Theft Auto II, still a top down pac man clone. We were connected to lots of our colleague son instant messaging but general communications were phone and SMS and of course email. So we were not tweeting and sharing pictures, or now as people do live feeds on Meerkat. Many people were not internet banking, trust in communications and computers was not high. We were pre dot.com boom/bust too. Not to mention no one really had much internet access out and about or at home. Certainly no wi-fi routers! We were all enthralled by the still excellent Matrix movie. The phone in that, the slide down communicator style Nokia being one of the iconic images of the decade. It was a wild time of innovation and one many of us remember fondly I think. People tended to leave us alone as we brought in money doing things no managers or career vultures knew to jump on. So that eclipse reminds me of a time I set on a path of trying to be in that zone all the time. I was back then getting my first samples from a company that made 3d printers as I was amazed at the principle, and I was pondering what we could do with designers that knew 3d and this emerging tech. We were also busy playing Quake and Unreal in shared virtual worlds across the LAN in our downtime so I was already forming my thoughts on our connection to one another through these environments. Having experiences that I still share today in a newer hi tech world where patterns are repeating themselves, but better and faster. That leads me to another movie reference and in the spirit of staying in this zone. This footage of a new type of Terminator T-1000 style 3d manufacturing. 3D printers may not be mainstream as such but many more people get the concept of additive manufacture. Laying down layer after layer of material such as plastic. It is the same as we made coil clay pots out of snakes of rolled clay when we were at school. A newer form of 3D printing went a little viral on the inter webs this week from carbon3d.com. This exciting development pulls an object out of a resin. It is really the same layering principle but done in a much more sophisticated way. CLIP (Continuous Liquid Interface Production) balances exposing the resin to molecules to oxygen or to UV light. Oxygen keeps it as a liquid (hence left behind) and targeted UV light causes the resin to become solid, polymerization. Similar liquid based processes use lasers to fire into a resin. This one though slowly draws the object out of the resin. Giving it a slightly more ethereal or scifi look to it. It is also very quick in comparison to other methods. Whilst this video is going faster than actual speed it is still a matter of minutes rather than hours to create objects. Another video doing the round that shows some interesting future developments is one from Google funded Magic Leap. This is a blended reality/augmented reality company. We already have Microsoft moving into the space with Hololens. Much of Magic Leap’s announcements have not been as clearly defined as one might hope. There is some magic coming and it is a leap. Microsoft of course had a great pre-release of Hololens, some impressive video but some equally impressive testimonials and articles from journalist and bloggers who got to experience the alpha kit. The video appeared to be a mock up but fairly believable. Magic Leap were set to do a TED talk but apparently pulled out at the last minute and this video appeared instead. It got a lot of people excited, which is the point, but it seems even more of a mock up video than any of the others. It is very ell done as the Lord of the Rings FX company Weta Workshop have a joint credit. The technology is clearly coming. I don’t think we are there yet in understanding and getting the sort of precise registration and overlays. We will, and one day it may look like this video. Of course it’s not just the tech but the design that has to keep up. If you are designing a game that has aliens coming out of the ceiling it will have a lot less impact if you try and play outside or in an atrium with a massive vaulted ceiling. The game has to understand not just where you are and what the physical space is like but how to use that space. Think about an blended reality board game, or an actual board game for that matter. The physical objects to play Risk, Monopoly etc require a large flat surface. Usually a table. You clear the table of obstructions and set up and play. Now a project board game could be done on any surface, Monopoly on the wall. It could even remove or project over things hung on the wall, obscure lights etc. It is relying on a degree of focus in one place. A fast moving shooting game where you walk around or look around will be reading the environment but the game design has to adjust what it throws at you to make it continue to make sense. We already have AR games looking for ghosts and creatures that just float around. They are interesting but not engaging enough. Full VR doesn’t have this problem as it replaces the entire world with a new view. Even in that there are lots of unanswered questions of design, how stories are told, cut scenes, attracting attention, user interfaces, reducing motion sickness etc. Blending with a physical world, where that world could be anywhere or anything is going to take a lot more early adopter suffering and a number of false starts and dead ends. It can of course combine with rapid 3d printing, creating new things in the real world that fit with the game or AR/BR experience. Yes thats more complexity, more things to try and figure out. It is why it is such a rich and vibrant subject. Just bringing it back a little bit to another development this week. The latest in the Battlefield gaming franchise Battlefield Hardline went live. This, in case you don’t do games, is a 3d first person shooter. Previous games have been military, this one is cops and robbers in a modern Miami Vice tv style. 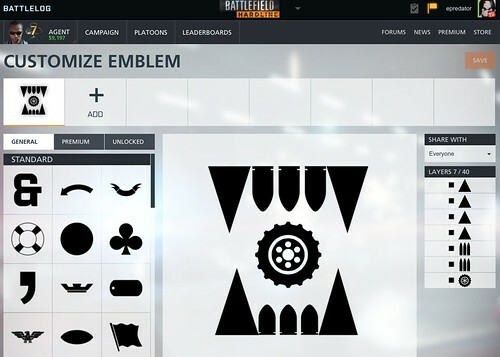 One of the features of Battlefield is the massive online combat. It features large spaces and it makes you feel like a small spec in the map. Other shooters are more close in like Call of Duty. The large expanse means Battlefield can focus on things like vehicles. Flying helicopters and driving cars. Not just you though, you can be a pilot and deliver your colleagues to the drop zone whilst you gunner gives cover. This new game has a great online multiplayer mode called hotwire that apps into vehicles really well. Usually game modes are capture the flag or holding a specify fixed point to win the game. In hotwire you grab a car/lorry etc and try and keep that safe. It means that you have to do some mad game driving weaving and dodging. It also means that you compatriots get to hand out of the windows of the car trying to shoot back at the bad guys. It is very funny and entertaining. What also struck me was the 1 player game called “episodes”. This deliberately sticks with a TV cop show format as you play through the levels. After a level has finished the how you did page looks like Netflix with a next episode starts in 20 seconds down in the bottom right. If you quite a level before heading to the main menu it does a “next time in Battlefield Hardline” mini montage of the next episode. As the first cut scenes player I got a Miami Vice vibe which the main character then hit back by referencing it. It was great timing, and in joke, but one for us of a certain age where Miami Vice was the show to watch. Fantastic stuff. I really like its style. It also has a logo builder on the website so in keeping with what I always do I built a version of the Feeding Edge logo in a Hardline style. I may not be great at the game, as I bounce around looking for new experiences in games, but I do like a good bit of customisation to explore. As you may have noticed I am a big fan of Unity3d. It has been the main go to tool for much of my development work over the years. 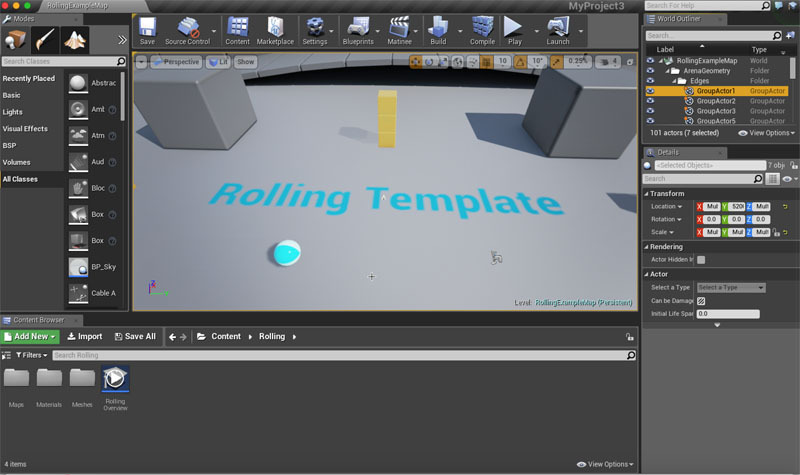 A while back I had started to look at Unreal Engine too. It would be remiss of me to say Unity is the way I have always done things so I will stick with that 😉 My initial look at Unreal Engine though left me a little cold. This was a few years ago when it started to become a little more available. As a programmer, and with a background in C++ I was more than happy to take on the engineering challenge. However it was almost too much being thrown at me in one go. There was a great deal of focus on the graphics side of things. It felt, at the time, more like a visual designers tool with code hidden away. This was different from Unity3d that seemed to cross that workflow boundary offering either simple code, complicated graphics, or vice versa. 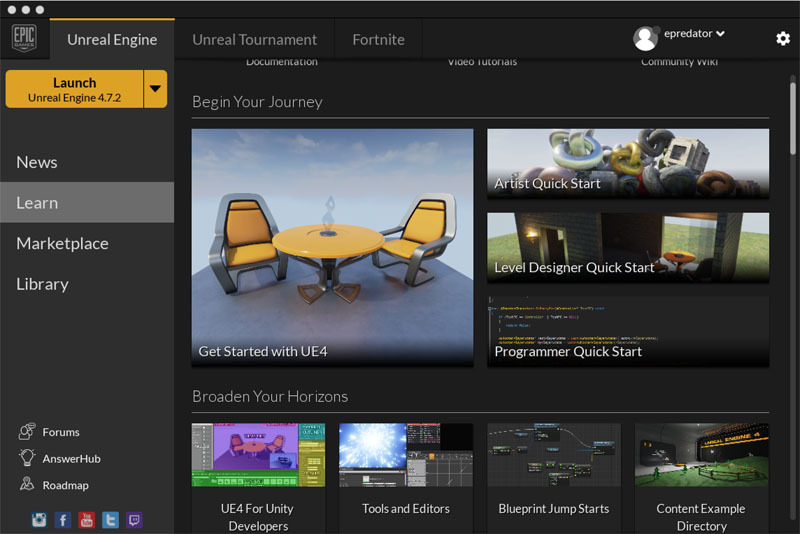 The new version of Unreal Engine, now fully free unless you make a lot of money building something with it, in which case you pay seems a much more friendly beast now. It has clearly taken onboard the way Unity3d does things. That initial experience and the packaging of various types of complexity allowing you to unwrap and get down to the things you know, but not get in the way on the things you don’t. The launcher has access to the tool but also acts as a hub for other information and to the marketplace. I can’t remember this from the last time I looks at Unreal, but it is very obvious now. The one document that leapt out is UE4 for Unity developers. This is addresses the differences and similarities between the two environments. Some of it is obviously a bit of “this is why we are better” and in some cases not strictly correct, particularly on object composition. However it is there and it does help. It recognises how huge Unity3d is rather the that slightly more arrogant stance that the toolset seemed to have as “we know best”. That is just a personal opinion and a feeling. That may seem odd for a software dev tool but when you work with these things you have a sense of who they are for and what they want to do. Unity3d has demo from humble beginnings as an indie tool grown to a AAA one. Unreal Engine, obviously had to start somewhere but was an in house toolkit that grew and grew making AAA titles then burst out into the world as a product. They both influence one another, but here it is the influence of Unity3d on Unreal Engine I am focussing on. Also on this launcher are the quickstarts. Showing the roles of Artists, Level designer and programmer as different entry points. Another good point, talking the right language at the start. Unity has a lot of sample projects and assets, some great tutorials. 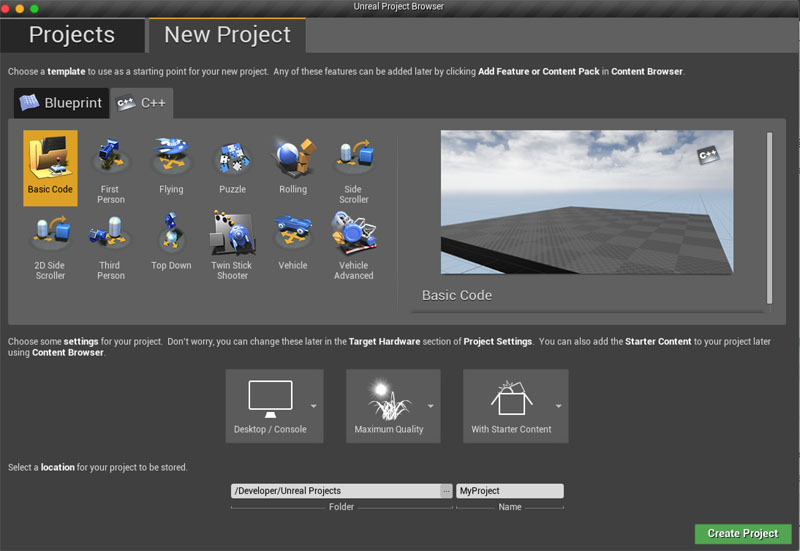 Unreal Engine now has this set of starter projects in a new project wizard. It is easy for more experience developers to sniff at these, but as a learning tool, or a prototyper being able to pick from these styles of project is very handy. I had a number of “oh that’s how unreal works!” moments via these. First person, puzzle, 2d side scroller, twin stick shooter etc are all great. Unity3d does of course have 2D or 3D as a starting point for a project. Though I have always found 2D a bit strange in that environment, as I have build 2d in a 3d environment anyway. The other interesting thing here is the idea of a C++ version or a Blueprint version. Blueprint is Unreal Engine providing a visual programming environment. Behavours and object composition is described through a programming facade. The blueprint can mix and match with C++ and shares some similarity with a Unity3d prefab, though it has more interactions described in visual composition than just exposing variable and functions/events in a prefab. Whilst blueprints may help people who don’t want to type c++. like many of the visual programming environments it is still really programming. You have to known what is changing, what is looping, what is branching etc. It is a nice feature and option and the fact it is not exclusively in that mode makes it usable. Unreal Engine also seems to be happy to work on a Mac, despite much of the documentation mentioning Visual Studio and Windows it does play well with Xcode. It has to really to be able to target iOS platforms. So this was another plus in the experience. 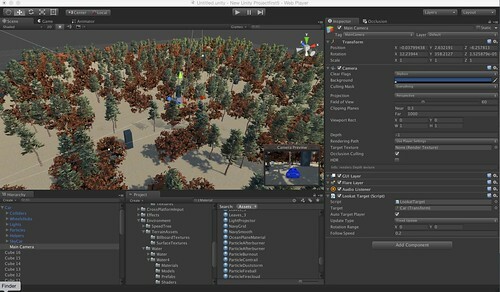 The main development environment layout by default is similar to Unity3d too. All this helps anyone to have a look at both and see what works for them. I am not a total convert yet. I still need to explore the multiplayer/server side of things. The ability to interface with other systems (which all my work ends up needing to do). Though I am not quite so turned off by it now. It seems a real contender in my field. So just like all these things you have to give it a go and see how it feels.